Call today to customize your bike. I tracked Freedom Concepts, Inc., online for three years before offering the maker of custom trikes for individuals with a disability the opportunity to become sole sponsor of cerebral-palsy-career-builders.com. I select my partners very carefully. During the last three years, I’ve been looking for a single company with an outstanding record of serving individuals who have a disability with a product line that complements my philosophy about disability. You see, I quit a mainstream job at the senior executive level when I was 51. No big deal, but, for someone with athetoid Cerebral Palsy since birth, that’s a big step. But, with the help of my wife, Pam, who also has mild Cerebral Palsy, and my extended family, I made the switch from being the only employee with a very noticeable physical disability in a Fortune 500 company to a solo entrepreneurship focused on helping individuals and families cope effectively with disability from a career-building perspective. That was in 1994. During the 23 years since then, I’ve researched, written and published more than 1,000 articles about disability awareness and disability employment issues. In doing so, I’ve gradually realized that disability, when framed strategically, can be an advantage in navigating today’s world, especially in the contemporary workplace. What does all that have to do with trikes – and Freedom Concepts? Pam and I each got our first feeling of freedom through cycling – and that liberation led to surprising outcomes for both of us. I was pretty shy as a kid from a dairy farm who was transplanted temporarily to Madison, WI. At seven, I had a tricycle, which I rode on the sidewalk close to my week-day parents’ home, where I stayed so I could attend an orthopedic school. One day I woke up to find my trike in shambles. Someone in the neighborhood had trashed it. That incident only stoked my anxiety. Yet, my parents bought me another trike. One spring evening, without the knowledge of my week-day parents, I mustered the courage to trike completely around the block of my Madison home, even though I knew the “tough guys” who had smashed my trike could be out in front of the next house. I made it around the block without incident. Afterward, I felt like I had “staked out” my territory. Why do I recall this incident almost seven decades ago? It was one of the first times I felt I could reach beyond my present circumstances, even though I didn’t quite the mold. It was one of my first steps in a long, satisfying, challenging life in which biking, for me, has been synonymous with freedom and opportunity. Pam had a similar experience with mobility. At 25, she was agile on a bicycle but had not earned her driver’s license because she lacked depth perception due to her Cerebral Palsy. She knew driving was the key to her independence. Pam kept practicing parallel parking until she finally passed her driving exam. It was her prime goal at the time, and she did it at the beginning of her 23-year career in hospital and home health care. 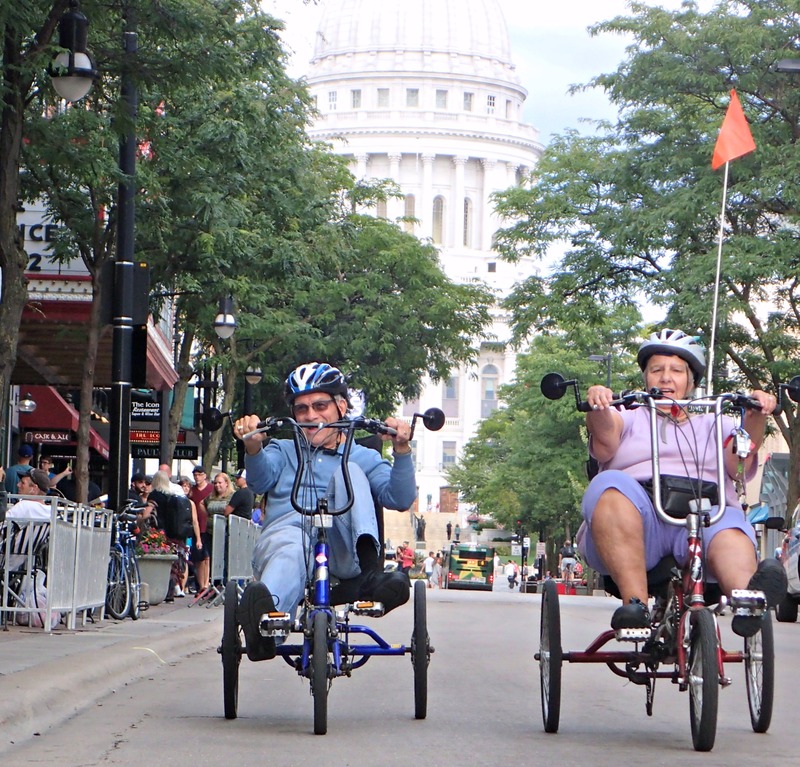 By the way, Pam and I, each at now 74, are still biking almost daily with our recumbent tricycles down one of Madison’s many bike paths, across the East Campus Mall and down State St. State St. is six blocks of hyperactivity which connect the University of Wisconsin-Madison campus with Capitol Square. The mobility we each gained from biking gave us an extra spurt of self-confidence early in our lives to break barriers in our pursuit of self-determination and a life of independence. That’s why I have chosen Freedom Concepts as sole sponsor of www.cerebral-palsy-career-builders.com. Pam and I enjoy our daily trek down State St.
Freedom Concepts employs people who have first-hand experience with disability and involves the therapists for specific customers in designing customized products so they fit individual needs. That’s the secret behind the ingenuity at Freedom Concepts. 2. Customer care is based on authenticity. That caring involves what matters (the values, hopes and dreams) for customers. "Caring is the new competitive edge. Caring about societal issues will soon have metrics developed around them. The companies that can prove they care the most -- and not just pretend to -- will beat the crap out of their competitors." The right product for the right market has long legs because it fulfills a series of needs that go far beyond its original, down-to-earth purpose. 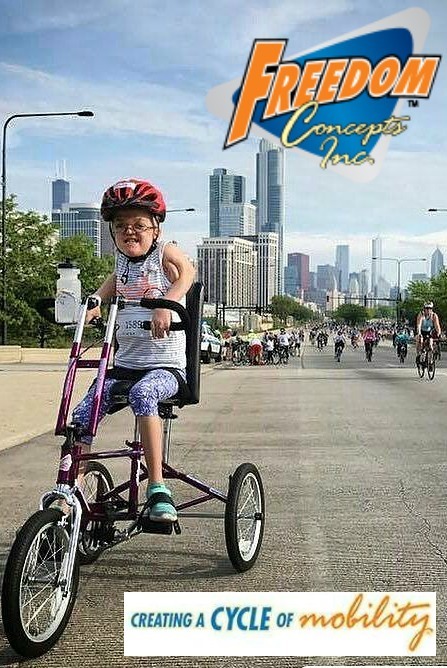 Freedom Concepts, for instance, may be in the business of custom-building mobility devices for individuals with disabilities such as Cerebral Palsy, Spina Bifida, Muscular Dystrophy and Angelman Syndrome. But, it’s also using its ingenuity to provide its customers with fun, recreation and freedom as well as the opportunity to develop self-confidence, self-determination and self-discipline (three attributes needed for a successful vocation). For Freedom Concepts, “creating a cycle of mobility” is providing the feeling of freedom, the platform for imagining new possibilities and pursuing independent living.